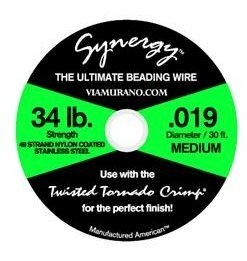 Synergy Beading Wire .019 - 49 strand - 30ft. You can earn 18 Club VM Points on this product! How do you use the product? : I love this wire, I use it to do beading, it is strong, very easy to work with and it is great quality for the money. Also it does not get tangled as other wire does! How do you use the product? : Use this wire on all my projects. Very good quality. Drapes beautifully.